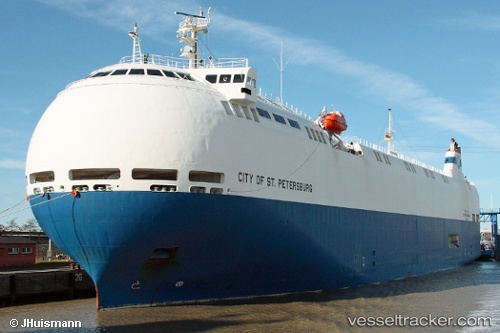 On Jan 14, 2019, around 4 p.m. the "City of St. Petersburg" allided with pilings of the sea lock in Emden upon its arrival from Grimsby, where she had sailed on Jan 12 at 8.20 p.m. The ship was assisted by two tugs when it was caught by strong wind gusts and pushed against the pilings off the lock with its starboard side. Both the pilings and the hull of the vessel suffered damage. The ship was detained by the relevant authorities and was to be subject of a port state control on Jan 15. The marine police Emden launched an investigation. The vehicles carrier left the port again after repairs of the hull damage at the quay on Jan 15 at 11.25 p.m. It headed to Grimsby with an ETA as of Jan 16, 11 p.m.